Photos at top show students at Chicago State University (CSU), a minority serving institution on Chicago's South Side, engaged in active learning environments that have been shown to aid diverse groups of students develop a deep understanding of physics. 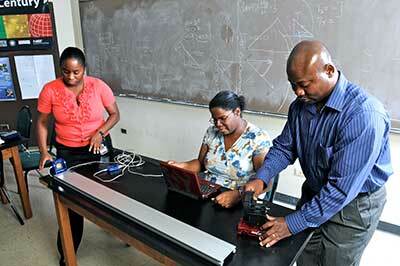 In top photo Ebony Spells, Angela Moore, and Sharif Onihale work on a physics lab experiment. Not that I've heard a lot from Chief Justices, but I don't recall Rehnquist saying something so demonstrably out-of-touch with the rest of the country; his mind is in the 1950's behind a white picket fence. The Chief Injustice is a microcosm of a privileged mindset that hasn't quite grasped we're in a global competitive environment, and more than his culture needs to row in the collective national boat. Sadly, due to financial stresses, this valuable asset will likely close this year. When such actions - intentional or unintentional - take place, "lifting yourselves up by your own bootstraps" is about as asinine as starting a sprint chained to the starting block six seconds after the gun fires the race. For want of "nostalgic," anachronistic prejudices of the mid 20th Century, we're setting ourselves up to be a banana republic in the 21st. On December 9, 2015, Chief Justice Roberts asked the question "What unique perspective does a minority student bring to a physics class?" during the discussion of a case on affirmative action at the university level. It appears that he chose a physics class because he felt that this discipline definitely does not need diverse perspectives. As a female physicist who has been teaching at the University of Pittsburgh for two decades, I feel that the Chief Justice’s question suggests a lack of familiarity with urgent issues in education that must be addressed to maintain U.S. competitiveness. The question first implies that it is the perspective of the minority student that is the critical feature rather than the presence of the minority student in the physics class. We need to attract minority students to disciplines that need their talents. Currently, approximately 20 percent of undergraduate and Ph.D. students in physics programs across the U.S. are females, which is significantly lower than the percentage in many European and Asian countries. What is perhaps more alarming is that only about 9 percent of physics undergraduate degrees and 6 percent of Ph.D. degrees are awarded to students from underrepresented races and ethnicities.